Welcome to CGV CINEMAS. In CGV CINEMAS the terms of 'Auditorium' is what they call "Theatre" somewhere else, and it is where we screen all of our movies on the largest screens in Indonesia. CGV CINEMAS presents the concept of "Cultureplex", where it brings entertainment by combining film, music, fine dining, and meeting point all in one place: The CGV CINEMAS. All of the CGV staffs proudly call themselves "stars" because of their unique differences. The difference lays on the costumer oriented services. 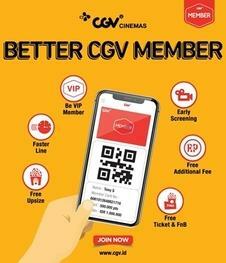 Each stars has the fresh and energetic bearings in giving services with warm and genial approaches, so each costumers can truly feel the amazing experience during their visit to CGV CINEMAS. All of these are based on CGV CINEMAS vision, "to be the ultimate choice for the most unforgettable experiences". 2. to create growth opportunities to all our stakeholders, employees, suppliers and community. Do you have what it takes to be a stars? If you are interested in joining this marvelous team delivering the unforgettable experience in entertainment, fill the form and send it to us.